From the Spring into Summer article in the June 2016 issue. Preheat oven to 500° F. Place golden and red beets in separate baking dishes and add water to reach halfway up their sides. Cover with foil and bake for 50 minutes. Remove beets from water, let cool, then peel off the skin. Cut off stems and tips, then quarter. Place in separate bowls, coating the red beets with a little olive oil to help stop the dye from bleeding. While beets are in the oven, make your tarragon aioli. To make mayonnaise, separate one egg, placing the yolk in a food processor or blender. Add 1 tablespoon oil (olive or avocado) and mix well; very slowly drizzle in 3⁄4 cup oil. Be patient and allow it time to incorporate. Add chopped tarragon and puree until smooth and green. Leave at room temperature while you prepare the other ingredients. Toss pea shoots and chives with a little red-wine vinegar, olive oil, and a pinch of salt. Cut off tops and bottoms of radishes and chop into quarters. Slice farmer’s cheese into 1⁄4-inch-thick pieces. Place in a hot nonstick pan, browning both sides, then cut into medium-sized pieces. To serve, put pea shoots in center of plate. 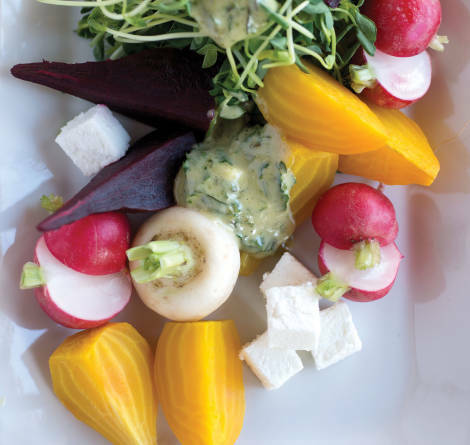 Arrange beets and radishes next to the shoots. Sprinkle cheese liberally atop and finish with dollops of aioli. Garnish with long chive pieces.